Apparently the entire village has come out. I can't say I'm surprised - they're always putting on musicals at the village hall, and the local Judy Garland appreciation society has been going strong for a number of years. My neighbour wears a lot of tight t-shirts too. Although that could just be because he's fat. But still, it gives new meaning to the phrase 'the only gay in the village'. I particularly like the way the author of this piece - a certain H.B.L. - has used a stick as a comma. That's what I call resourceful. Or autumnal. One or the other. 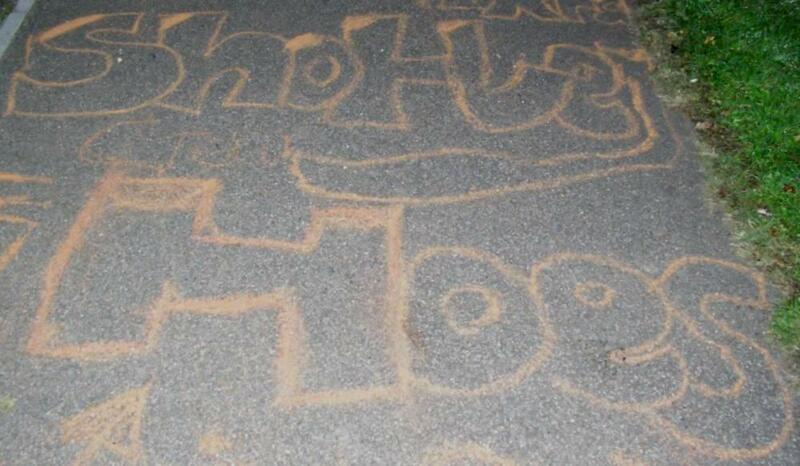 Fortunately, those responsible for this piece of decorative street art were only too happy to come forward. 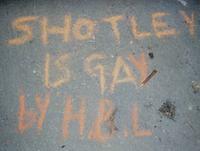 It turns out that the literary collective behind these public declarations of homosexuality are in fact the 'Shotley Hoes'. Which is presumably some kind of local gardening club. And they number amongst them such pillars of the community as 'Rach', 'Vix' (who probably has nasal congestion) and 'Meg'. Who sounds quite mystic. 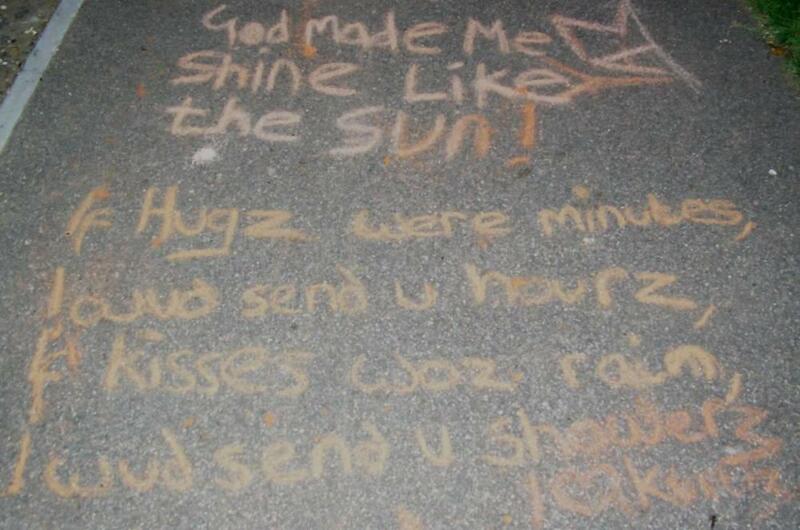 I'm particularly pleased to see that the Hoes are all good Christian girls, and have been blessed by the Almighty. Oh yes indeed, God has given them style. Which is very kind of him. Although frankly if he can do it for the Shotley Hoes, why did he make Jesus wear those awful robes? But glossing over that, one Hoe in particularly looks to have been singled out for greatness, stating "God made me shine like the sun!". So if you look directly at her, you'll go blind. I wud send u showerz." I think that's possibly the most beautiful thing I've ever read. Although spelling clearly means nothing to the Shotley Hoes. They're probably too busy gardening to read a dictionary.